John Wayne and James Stewart in The Man Who Shot Liberty Valance. 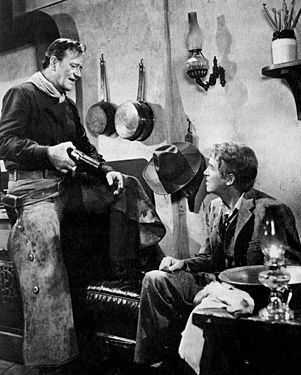 John Ford’s last great masterpiece, The Man Who Shot Liberty Valance (1962), appears to be a dark tribute to westerners such as Tom Doniphon (John Wayne) who packed a gun and tamed the wilderness so that civilized, thinking men such as Ranse Stoddard (James Stewart) could bring to it law and order and transpose the wilderness into a garden. However, Doniphon died a drunken, dislocated man. He built a home which he assumed Hally (Vera Miles) would share with him as his wife, but he lost her to the hero of the moment, Stoddard. With the visual progression of the train--coming and going (an image which frames the film)--Ford seems to suggest that with encroaching civilization old-time heroes such as Doniphon needed to move aside. And thus this film is an elegy for the dead. Told in flashback, Stoddard (now a successful senator) tells of his run-ins with Liberty Valance (a wonderfully menacing performance by Lee Marvin, who decked in black and sloping around like an ape, becomes a Bogartian Duke Mantee of the West) and how he conquered Valance with the help of Doniphon. In a moment of monumental ellipses (Ford’s narrative dramatically withholds information from the audience), it is the killing of Liberty Valance that poses the film’s central problem. Ford’s narrative plays with story and discourse (what we see in the film’s running time versus what actually occurred) forcing the audience to reassess earlier scenes. Valance, after a series of embarrassments, challenges Stoddard to a duel. They meet in a deserted street. Valance toys with Stoddard, firing at a flower pot above his head, wounding him in the right arm, and then raising his six-gun to shoot the young lawyer "right between the eyes." Suddenly the tender-foot, gun in left hand, fires. Valance flings back and falls into the street. Years later, when the two men meet at an election and Stoddard is troubled by making his name through the killing of Valance, the unshaven Doniphon, in close-up, blows cigarette smoke and says, "You didn’t kill Liberty Valance. Think back, pilgrim." On the revised narrative, we learn that Doniphon and Pompeii (Woody Stroode) waited in the wings of the street as Valance tormented Stoddard. In a wonderful Fordian triangular composition, Doniphon, at the foreground base of the triangle and at an acute angle to Valance, fires the fatal shot. His act of heroism comes at a great cost. "Cold-blooded murder, but I can live with it. . . . Hally’s happy she wanted you alive," he says to Stewart at the convention, his disheveled appearance belying his words. But did Doniphon, alone, kill Valance? This question has haunted me for years. If we read the film traditionally and contend that Wayne sacrificed himself and the woman he loves for the good of civilization, making Stewart the somewhat false hero, then the film resonates an elegy for the dead, and the image of Hally’s cactus flower on Tom’s coffin and her own admission to her husband that she put it there sings a kind of sad tribute of lost love. However, what if Stoddard killed Valance? A close return look at the second shooting scene shows smoke wisping from the barrels of both weapons simultaneously. No doubt Doniphon, a tough-guy hero, hit his target, but maybe Stoddard did too. The slim possibility exists that Stoddard could have done the killing without Doniphon’s help. And if that’s the case, then the film deconstructs a traditional garden/wilderness reading and the resounding words of the editor, "This is the West, sir. When the legend becomes fact, print the legend," resonate as ironic fallacy. What if Stewart didn’t need Wayne’s gun, and Wayne didn’t need his self-consuming guilt? Wayne’s decline and debasement were for nothing and that’s a lot darker notion to ponder than the darkness this film already radiates.